Home / Online Deals / Christmas / iPhone Battery Charging Cases as low as $25.90! iPhone Battery Charging Cases as low as $25.90! iPhone Charging Cases! 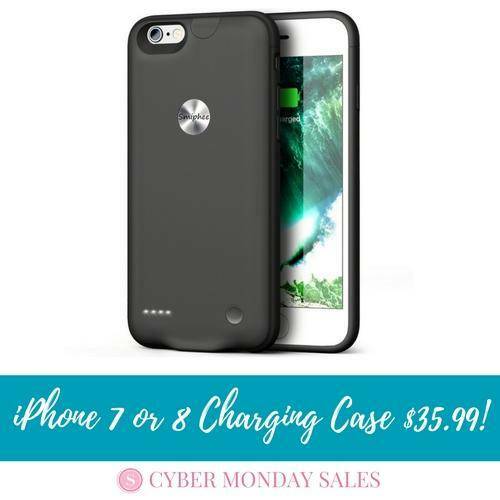 Check out the cheapest prices and best deals on battery charging iPhone cases for 6, 6s, 7 or iPhone 8! These are SO COOL! If you are tired of your phone dying, you can get iPhone Charging Cases on sale for as low as $25.90! Amazon has this iPhone Battery Charging Case for iPhone 6 or 6s for $35.90, and the code WKE8XALY drops the price to just $25.90. It has 4 out of 5 stars and and over 2,500 reviews! I don’t know how long that code is going to last, so I would order it now if it is on any lists this year! This iPhone 8 / 7 Battery Case is just $35.99 and it has the best reviews for the price point! Amazon.com Price: $35.90 (as of 11/26/2017 09:12 CST) Product prices and availability are accurate as of the date/time indicated and are subject to change. Any price and availability information displayed on Amazon.com at the time of purchase will apply to the purchase of this product. We are not responsible for and cannot control changes in pricing and availability, these change frequently so we recommend that you always double check the price before making a purchase. And see the Kindle Fire Tablet $29.99 – Black Friday Price Still Available! Adidas Clothing, Shoes, & Gear Up to 50% off!